Categories: Determination, Divine Names, Guru, Love, Prayers, Satsang, Spirituality, Sri Muralidhara Swamiji. This series chronicles interesting experiences recounted by the devotees of HH Maharanyam Sri Sri Muralidhara Swamiji. These articles are translations from the series, “Madhuramaana Mahaneeyar” that is published every month in Madhuramurali Tamil monthly magazine. The original article was written by Dr. Bhagyanathanji, Personal Secretary of Sri Swamiji. Karunamai has deep love for her mother. Due to age related illness her old mother was bed ridden for several months. To remain with and serve her mother in her last days was one thought that had taken hold of Karunamai. She, therefore, remained with her mother in Sydney and was serving her. Her mother had neither the darshan of Guru Maharaj nor had been initiated by him. But Karunamai always had one prayer – ‘Guru Maharaj! My mother should also receive your blessing’. Every time she visited India she would offer this prayer to Guru Maharaj; she would pray for and take some kind of Prasad from Guru Maharaj for her mother and give it to her. On the morning of 1st January 2017 Karunamai called me from Australia. She said, “I desire to pray once again to Guru Maharaj on behalf of my mother. Doctors opine that she would live only for some weeks or months. Please do inform Guru Maharaj about this.” Immediately I informed our Guru Maharaj about Karunamai’s prayer. At once Guru Maharaj asked me to pass on the following message to Karunamai – “Innumerable Mahans have said that not only those who chant the Lord’s Divine Name but also those who have begotten such children shall certainly attain to the Lord’s holy feet. So, inform Karunamai that Premika Varadan would take her mother unto His holy feet for the one reason of having begotten this one daughter who chants the Mahamantra. Ask her to immediately chant the Mahamantra thrice in her mother’s right ear.” Guru Maharaj asked me to convey this message at once to Karunamai over telephone. I did as bid. Karunamai asked me, “The doctors have said that my mother would live a few more weeks or months only. 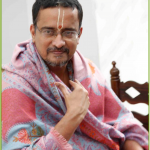 Should I chant the Mahamantra right now or when the time comes?” I told her, “Guru Maharaj has asked you to chant it immediately, right now.” Karunamai at once went to the hospital and chanted the Mahamantra thrice in her mother’s right ear. At the same instance, in India, Guru Maharaj’s mass prayer was being conducted at Kalatipet. In Australia Karunamai’s mother’s life left the body and as told by Guru Maharaj it attained to the holy feet of Krishna. Karunamai shed tears thinking of Guru Maharaj’s compassion. She felt elated that her mother who had never had a single darshan of Guru Maharaj had attained to such great state. During her recent visit to the Ashram Karunami had brought two Australian mangoes for offering to Guru Maharaj. When Guru Maharaj came to Bhagavata Bhavanam she prostrated before Guru Maharaj and offered the two mangoes. Looking at the two mangoes Guru Maharaj said, “They do not look like two mangoes to me. I only see the two fruits – fortitude and perseverance. If you chant the Divine Name with fortitude and perseverance you will certainly reach your goal,” and smiled. Karunamai was very happy. This was a stimulating upadesh for her. Guru Maharaj laughed and said, “Do you wish to know the answer for this? I am also searching for an answer to this! I also do not know the answer. You keep chanting the Divine Name incessantly. If you keep on chanting the Divine Name the answer to this would come in search of you. You then come and give me the answer received.” Guru Maharaj then blessed Karunami with three fruits. Karunamai understood that Guru Maharaj desired her to do Namakirtan incessantly. On receiving the Prasad, a thought arose in Karunamai ‘Guru Maharaj would say three things to be prayed for of the Lord are wisdom, devotion and determination [jnana, bhakti, vairagya]. It is verily that Guru Maharaj has blessed me with’. Very joyfully Karunamai received those three fruits.